The Sun is the star at the center of the Solar System and is by far the most important source of energy for life on Earth. Over the course of human history the Sun has been feared and worshiped. Here are 50 Facts about the Sun. 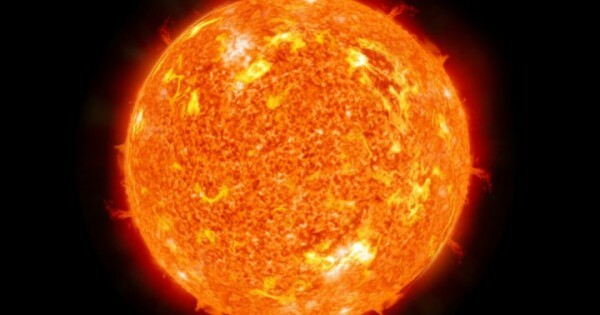 The size of the Sun compared to the largest known stars (red giants) is not very big. However, if compared to the most common type of star in the universe, the red dwarf, the Sun is quite a bit larger. At about 864,000 miles (1.4 million kilometers) wide, it could hold 109 planet Earths across its surface. If the sun were a hollow ball, more than a million Earths could stuff inside it. Much like the earth, the Sun has many different layers that define its structure. Unlike the earth, the Sun is completely gaseous, there is no solid surface on the Sun. The Sun is a very active star. No matter when or where you look, the Sun is always doing something interesting. One of the most dramatic properties of the Sun's activity is the existence of a solar cycle, which is best seen in the pattern of sunspots. One of the most obvious signs that the Sun is not just sitting there is its rotation. The Sun rotates on its axis about once every 26 days. Because the Sun is made of gas the rotation is quite different from that of, say, a basketball spinning on your finger. The Sun will continue to burn for about 130 million years after it burns through all of its hydrogen, instead burning helium. During this time it will expand to such a size that it will engulf Mercury, Venus, and Earth. The energy created by the Sun’s core is nuclear fusion. Considering the sheer size of the Sun, there is only a 10 km difference in its polar and equatorial diameters – this makes it the closest thing to a perfect sphere observed in nature. The Sun is travelling at 220 km per second. With a mean average distance of 150 million kilometres from Earth and with light travelling at 300,000 kilometres per second, dividing one by the other gives us an approximate time of 500 seconds, or eight minutes and 20 seconds. Because the Earth travels on an elliptical orbit around the Sun, the distance between the two bodies varies from 147 to 152 million kilometres. The sunrise and sunset occur so regularly that we often take their consistency for granted. Though ordinary and expected in mind, in reality the Sun is essentially the sole reason for our survival as a race. The Greek philosopher Aristarchus is credited as being the first person to claim that the Earth orbited the sun. Egyptian, Indo-European, and Meso-American cultures all had sun-worship religions. Solar flares are jets of particles that burst from the sun and can disrupt satellite communications and knock out electricity on Earth. At its core, the sun’s temperature is about 15 million degrees Celsius (about 27 million degrees Fahrenheit). The Sun does not have a definite boundary, and in its outer parts, its density decreases exponentially with increasing distance from its center. As passengers on Earth, we are all carried around the sun at a mean velocity of 66,600 mph (107,182 km/h). All of the world's energy needs can be met with 1/10,000th of the light from the Sun that falls on Earth each day, according to the inventor Ray Kurzweil. Isaac Newton developed a sunlight phobia from staring at the sun. Partial solar eclipses are hazardous to view because the eye's pupil is not adapted to the unusually high visual contrast. If you could take a journey in an normal airliner flying at its normal speed (about 644 km an hour) travelling from Earth to the Sun, it would take 20 years to reach your destination, and that's without stopping. The Sun was formed, like every other star, from a huge swirling cloud of gas called a nebula. The cloud contained all the matter which went together to form the Sun and its family of planets, moons and hundreds of thousands of asteroids, meteors and comets. Every 11 years, solar activity surges. The sunspots that pepper the sun explode, hurtling massive clouds of gas known as "CMEs" through the solar system. This is called “solar maximum. Four million tons of hydrogen are consumed by the sun every second, which helps to create the sun’s composition of 75 percent hydrogen, 23 percent helium, and 2 percent heavier elements. The Sun has a very strong magnetic field. Solar flares occur when magnetic energy is released by the Sun during magnetic storms, which we see as sunspots. In sunspots, the magnetic lines are twisted and they spin, much like a tornado would on Earth. Planets with strong magnetic fields such as Earth manage to deflect most of these charged particles as they approach. Sunspots appear on the surface of the Sun and look dark because of the lower temperatures near it. Helmet streamers are big white regions that extend out from the Sun in which solar plasma are trapped by the magnetic field of the Sun. The Sun’s energy travels outwards. If the Sun were to stop producing energy today, it would take 50 million years for significant effects to be felt at Earth. The density of matter at the Sun's core is about 150 times the density of water in the Earth. No Total solar eclipse can last longer than 7 minutes and 40 seconds. The Sun will remain as a White dwarf indefinitely after 7.9 billion years. The Sun is at a distance of 30,000 light years from the center of our Milky Way galaxy and lies on one of it's spiral arms.